When Sage Prairie Inc. and MAT Clinic came together under the Sage Prairie brand, they knew they needed to reshape their two outdated websites into one modern destination for those seeking medication-assisted treatment for drug and alcohol addiction. Website. We designed and built a highly engaging, visually appealing website with soothing imagery intended to make a person in crisis feel calm. 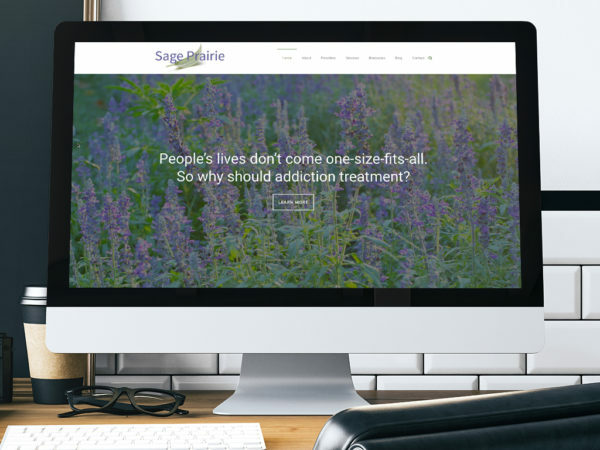 We populated the website with search engine optimized content in the form of text and videos that demonstrated Sage Prairie’s thought leadership in the field of drug and alcohol recovery. Content. It was important that we accurately portray how Sage Prairie is different from other treatment providers in the field of drug and alcohol recovery. We interviewed key stakeholders at Sage Prairie several times to glean the most important information to include on the new site. We also reworked some of the content from the old sites for use on the new site. Video. Sage Prairie’s medical director is a well-known thought leader in the field of medication-assisted treatment, and we wanted to leverage her expertise and comfort on camera to create useful, helpful content that would assist in search engine optimization. We decided on interview-style videos and related blog posts as the best way to capture her expertise and build trust with the audience. We developed ten explainer videos, based on keyword research, which live on a resource page on the website as well as Sage Prairie’s YouTube channel. Call us today to learn how we can use video and a new website to elevate your organization to thought leadership status. 651.357.4174.